King County Metro bus service—the public transportation lifeline for Seattle and greater King county area—faces drastic impending funding cuts to be implemented as soon as Fall of this year. The cuts will greatly reduce bus service on certain routes and entirely eliminate others, a prospect which has many members of the greater Seattle community in panic. 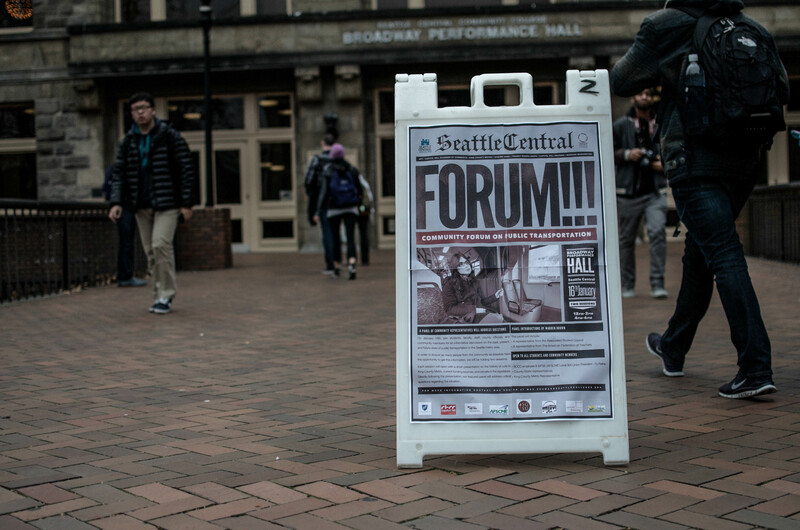 In an effort to address the looming crisis, two public forums took place at Seattle Central Community College (SCCC) on Thursday, January 16th. 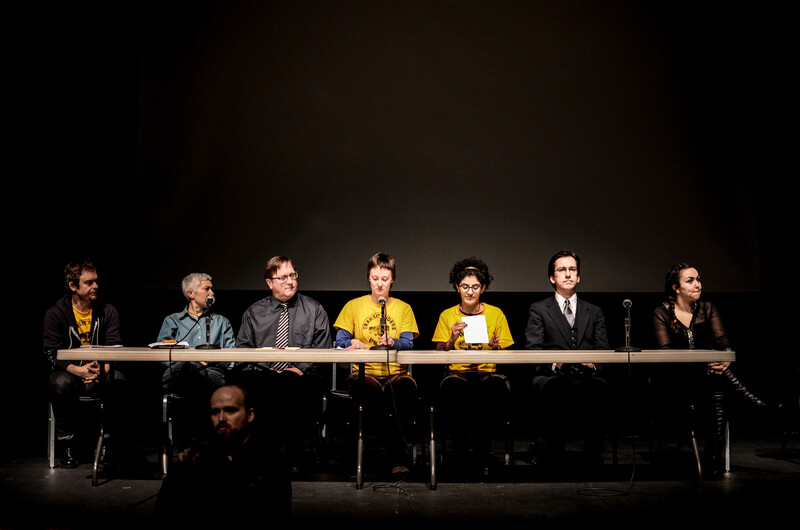 The community college hosted a panel of representatives from the Transit Riders Union (TRU, a volunteer group of concerned Seattle residents), King County Metro (KCM), AFT, and a mixed bag of other affiliated groups while Dominic Holden, The Stranger’s News Editor, moderated the conversation. The proposed cuts would eliminate 74 bus routes and reduce the frequency of others, leaving many King County residents with little to no means by which to get around. Only 33 routes will remain unaltered, a devastating blow to King County residents. “In my neighborhood [Leschi] four of the five buses that we ride regularly are going to be gone. It’s going to make a big difference for our family,” said Carla Salter, a concerned citizen and active transit blogger, also present at the forum. Seattle has come to pride itself on being a city with an avid use of alternative forms of transportation, namely bicycles and the public bus system. Census Bureau data published by the Seattle Bike Blog showed that over 50% of Seattle residents use alternative methods of transportation to get to work rather than driving personal cars. These figures are projected to increase as the city itself, grows. The ‘War on Cars’ is in cultural full throttle. However, the current and future state of KCM does not reflect this demand. The cuts, totaling around 17% of Metro’s current operating budget, come from a $74 million fiscal shortfall due to the steady decline in state allocated funding from sales tax revenue (the majority of KCM’s funding), largely caused by the 2008 economic recession and austerity measures that were dished out on the state level. Since then, KCM has been trimming the fat wherever it can, cutting staffers and raising fare prices, putting the brunt of the cost on the people who will be hurt the most: the riders and drivers. “We have no more time, no more reserve [money], or magic rabbits to pull out of our hat to keep service on the street,” said Chris Arkills, a transportation policy advisor for King County. Now that KCM is really at the end of the rope, the Majority Coalition Caucus in the state Senate (a group of predominantly Republican legislators) has indicated. that they will allow for King County to utilize a motor vehicle excise tax of 1.5% if they also accept the rest of the state-wide package. This package designates $12 billion in funding for more highway development, a low priority for the public transit-loving populace of Seattle. “They are basically holding King County hostage. [They say] vote for this terrible thing that nobody wants, and you’ll get authority to tax yourself,” said TRU Assisting Secretary, Beau Morton. 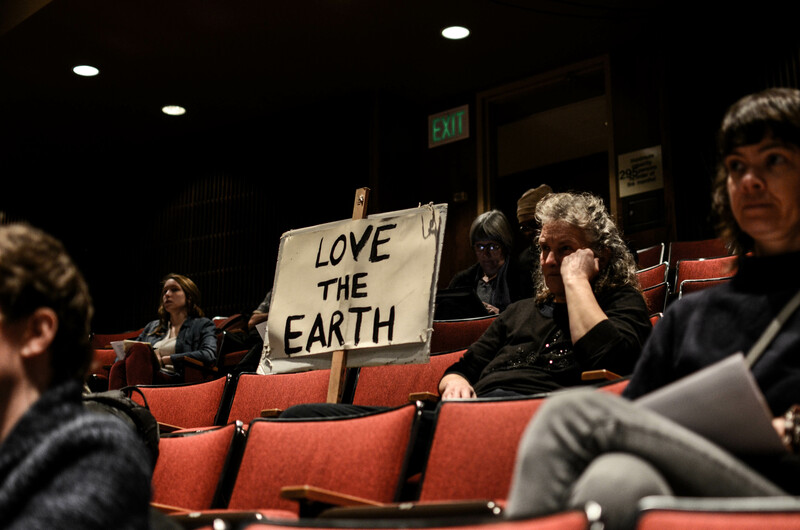 The alternative is King County’s recently released “Plan B” ordinance, which includes a raised sales tax, car licensing fees, and a 25-cent fare increase—with the exception of a $1.50 low-income rate for those who fit the criteria. The proposal would be put before county voters who would make the final decision. There are many viable and varied forms of taxation to provide revenue for public services. Concepts such as a progressive income tax come to mind, but we’re behind on the times seeing as King County has thought of most of these ‘tax tools’ already and is eager to implement them. It is only the House and Senate Legislator who seem keen on applying general policy to the very diverse state of WA, and who say that Seattle has to sit on its hands. WA state has a particularly top down hierarchical approach when it comes to how counties and cities can obtain revenue. The state Legislator currently only allows King County to use sales tax and ticket fare revenue to fund KCM, while explicitly disallowing taxation of land development or construction, a popular revenue source in Seattle given the steady stream of high end apartments popping up across town. For transit riders, it is like being stuck between a rock and a hard place. The state’s proposal only keeps the county limping onward for the short term, destined for the same exact pickle of a situation just a few years down the line. The county “Plan B” ordinance, on the other hand, results in higher costs passed on to the riders and a disgruntled populace. Panel representatives of TRU stated that they have yet to officially endorse either of the two proposals, but will be organizing to not just pressure the legislature to stop the cuts but to formulate a long term public transit funding solution that works for King County. As the panel concluded its opening remarks and the Q&A session began to unfold, the conversation reflected a underlying theme of concern regarding the austerity measures being implemented on all fronts. The growing consensus was that major reforms must be made to alleviate the pressure of regressive tax revenue systems that disproportionately affect lower-income and middle class populations. Washington currently holds the loathsome status of being the state with the most regressive tax system in the country. Tarrell Forest’ Paramore, a former SCCC student who currently works in the college auxiliary services department who was present at the forum expressed these sentiments specifically. “I don’t understand how Boeing can get what they ask for but Metro can’t get what we ask for,” said Paramore, referring to subsidies that Boeing and similar corporations receive in WA State. “This is a values struggle of making sure that the workers who make the economic engine of our state tick get their fair share,” said Dominic Holden. 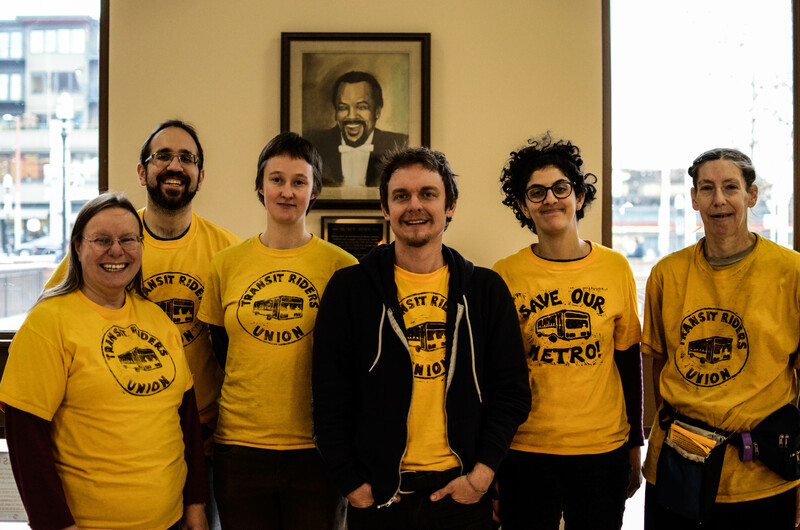 The Transit Riders Union will be hosting their next organizational meeting on February 3rd at the Seattle Labor Temple at 6:30 PM to organize counter efforts to the the cuts. More information on alterations and the elimination of specific bus routes can be found here.